Why not use up unfed or ‘discard’ sourdough starter to make salt dough? Incorporating my love of baking with my love of crafting (and a very strong discomfort with wasting perfectly good flour…). Roll out, etc. then bake at 200F for 2 hours or until dry. This can also be air dried, but it will take a few days. My sourdough starter is currently 1:1 flour and water, so it was just a matter of adjusting quantities. I am getting low on all purpose, so I used whole wheat LOL. Um, it’s decoration – yeah, that’s it. I’m going to guess that this salt dough, if left to ‘rise’ might be capable of making interesting puffy shapes. But I didn’t wait to find out. It’s a pretty simple recipe, so I just eyeballed it. I rolled a ball and started rolling it out to about 1/4″ thickness. You can roll this stuff thinner or thicker if you like. It is pretty easy to work with and stays workable a very long time. I used stamps to make a few designs, I didn’t use ink, but it would work if you wanted to ink your stamp first. Then I cut them into shapes with a knife and arranged them on a baking sheet. 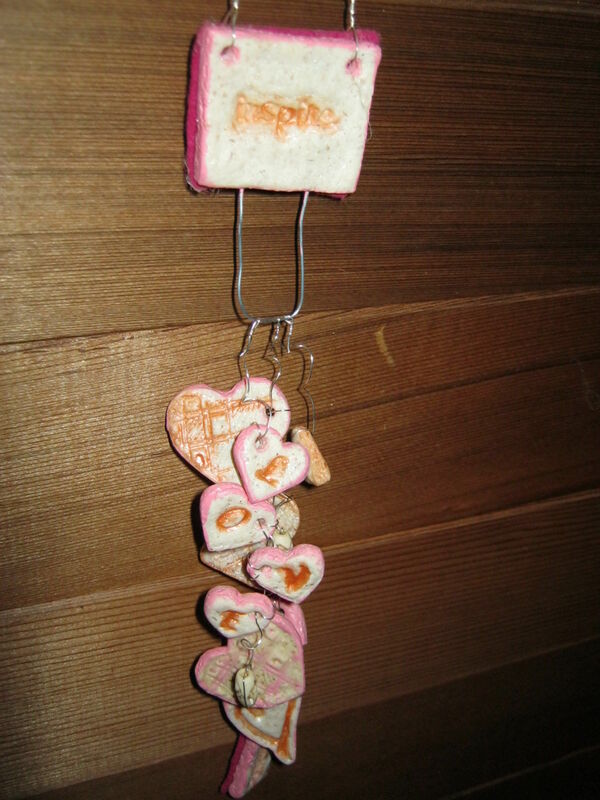 I then used a chopstick to make holes through them so I could hang them later. I also inserted wire in the edge of one. After baking at 200F for 2.5 hours, they were dried through. I sanded the edges and then used my lace kemper tool to clean up the edges of the hole on the backs of all of them. I painted them using nail polish. I experimented with a few things and watercolor worked pretty nicely as well, but I really like the coverage and bold color I got with the polish. It also adds a nice lacquered look. They could be coated with polyurethane at this point to waterproof them, but I wasn’t interested in that for this project. I used hot glue to attach felt on the back side of a few pieces and used jump rings in others. I still have quite a few to paint and use somewhere! I decided to curl the wires by wrapping them around a chop stick. I really like the wall decor and the key ring! Great ideas!